Allie loves the movie Tangled. Heck, I do too! She loves the songs and the lanterns but, most of all she loves the hair! That's why when I saw the idea for Rapunzel hair made out of yarn as a party decoration on Super Mom Moments I knew I had to make a hair piece for her! I wanted Allie's hair piece to be thick so here is what I did. I measured out three sets of 25 6 foot long pieces of yarn. So a total of 75 pieces of yarn all cut to 6 feet long. Be careful to keep the yarn straight. And it is probably not a good idea to make this around kids that want to keep touching the yarn before you are finished! I speak from experience! I tied all three sets of yarn together at the top being careful to keep them separate. Then I started braiding them slowly. Be sure to pull the yarn tight and move the entire length of the set of yarn you are working with over to the other side so the bottom does not get, well, tangled! It took a bit of time but it was very simple. 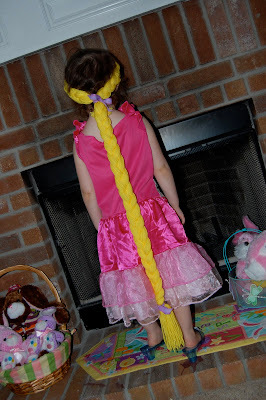 Once I braided it all I tied the bottom together with a rubber band and added a purple ribbon bow. For the top part I wrapped it around Allie's head how I wanted it to fit then I tied the pieces together with a broken rubber band. I added a purple ribbon bow to that and voila! It turned out so cute and it fits perfectly on her head and it is so comfortable for her to wear. 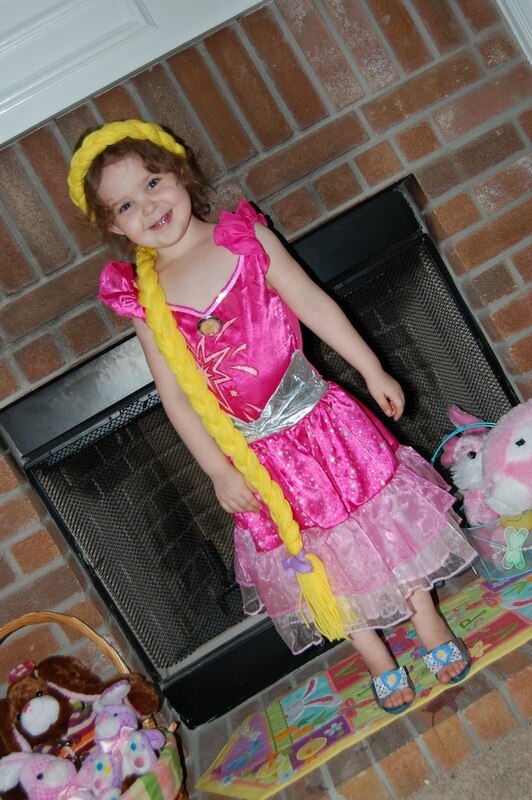 She was beaming when she tried it on and even went as far as to tell me I was the very best mom ever! Oh thanks! I can't take credit for the idea but it definitely made my daughter's day. And she still plays with it! !